Pete Carroll had an awkward beginning at USC and an awkward end, but he had a tremendous impact on football and they community that he revisits this weekend as coach of the Seahawks. LOS ANGELES — Say what you will about the NFL’s inept meanderings through social issues. The most successful sports enterprise in America does know theater. Bringing back to Hollywood the Rams after 21 years and Pete Carroll after seven years, in the same football game? Even scriptwriters for “Celebrity Apprentice” would cringe at the corny implausibility. But here we are, the relocated Rams and the Seahawks’ reinvigorated Carroll, at 1 p.m. Sunday in the revered Los Angeles Coliseum (pop: 92,000). What a thing. Both entities left LA amid controversy and bitterness. Now they return, hailed. Well, for sure the former St. Louis Rams will be hailed, if an NFL-record sale of 70,000 season tickets in four months means anything. Carroll nominally will be the villain, because he coaches the visitors, and because he left his job at USC in 2010 just before NCAA sanctions hammered the Trojans back to the pre-Carroll era of average-ness, where they remain (Alabama 52, USC 6 two weeks ago). But that period from 2001 to 2009 — seven Pac-10 titles, two national championships — cannot be forgotten. In the absence of pro sports team success, Carroll — glib, energetic, handsome, charismatic and hugely successful — was known as the King of LA. It is not forgotten. That is how Carroll chooses to remember it. “Nothing but fun memories and fun,” is how he put it this week. “We had a great time down there. We were so lucky to be there. SC was such a blast. We had so many good times and were able to connect with so many people. It was just a treasure. It’s the fondest. Omitted from Carroll’s recall was the non-fun of NCAA sanctions, over which he remains defiant. Another aspect of non-fun stuff was the beginning of his Trojans career. Given his subsequent success at USC as well as with the Seahawks, it seems absurd now to recall that, after then-athletics director Mike Garrett in December fired Paul Hackett (cumulative 19-18 mark), Carroll was fourth on the list of candidates. Garrett really wanted Oregon State’s Dennis Erickson, the former Seahawks coach. Failing that, he wanted Oregon coach Mike Bellotti. Both leveraged the Trojans’ interest into contract extensions. Then Garrett was down to NFL Chargers coach Mike Riley, a former USC assistant, who couldn’t make up his mind. In frustration, Garrett picked Carroll, who hadn’t been in college coaching since 1983. The choice was met with much skepticism for a two-time loser at the NFL level. Carroll this week seemed amused at the recollection of the dismay. “Oh, it was obvious and it was heavy,” Carroll said. “They even waited a few extra days to try and hopefully quell the storm, because they knew it was coming. It didn’t do very well. So it did. Exploiting the absence of the NFL — the Raiders left for Oakland and the Rams for St. Louis, both in 1995 — LA got over its apprehension and fell hard for Carroll. After a 6-6 first season, the Trojans never lost more than two games the next six years, creating a nine-year record of 83-19. Speculation was persistent that the only way Carroll would leave USC would be to coach whatever franchise relocated to LA, which every year seemed to be a fresh team fighting its municipality for public funds to build a new stadium. Part of the reason Carroll seemed wedded to the town was his intense involvement with inner-city LA to push back against gang violence that claimed so many young people. In 2003, Carroll helped convene a meeting of the city’s political, legal and social leadership to chart an improved course. What emerged was A Better LA, a non-profit charity tasked with bridging the racial divide. Carroll had already made his mark when he went door-to-door in the Compton and Crenshaw neighborhoods, doing some talking but more listening. It made him a civic figure beyond the Coliseum. One of the kids he talked to was Richard Sherman, a talented wide receiver and defensive back from Dominguez High. Although he chose Stanford over USC, Sherman remembered Carroll as unique. “He did a lot of work in areas that most coaches wouldn’t even go into,” Sherman, an NFL player of some note, said this week. “Areas with a lot of housing projects that he would go into, that I wouldn’t even go into, realistically. People respected a lot of the work he did in the community. They allowed him pretty much a free pass to go wherever he wanted, because he really put his money where his mouth was. “He met with gang members, community members and community leaders. He also met with police and tried to bridge the gap. He tried to bring people together and come to a solution on the gang issue and violence that was going on in the city. I think people respected that because he didn’t have to. As the head football coach at USC, it’s not your obligation to go back and help that community. He’s not from those streets. Carroll’s first community meeting was, as is typical with him, unorthodox. “I got in all kind of trouble because people came from all over the place and I didn’t go through any of the right protocols (at USC),” he said Friday. “I didn’t know what I was doing. We had an extraordinary turnout from the police department, sheriff’s department, community-based organizations, churches, local kids. There, the dialogue started. Once the gang-bangers were over the shock, they started listening. “They thought I was crazy — they thought, ‘What are you doing?” he said. “Kids in the area that were from troubled backgrounds knew that they were either going to die or they were going to jail. That’s really what they told us. With the help of volunteers and corporate donations, A Better LA began to be an influence in LA street culture. Carroll, a man of endless words, found that conversation became a virtue when it came to getting opposing sides to come together. Carroll is back in town, and people are talking about him again. But it’s mostly about football. When he flies back to Seattle Sunday night, he hopes the the fractious metropolis continues to talk about more important things. Wow. I never had any idea. Love this guy. What a great example of leadership and caring. Thanks Art. It’s been a key aspect of Carroll’s life, but there’s always new readers. Glad you enjoyed. I have to admit, I was really skeptical about the Carroll hiring and thought he was getting out of town before the infractions came down. But I’ve read enough about “A Better LA” and “A Better Seattle” to realize we’ve been fortunate for his time in our city. And that’s all beyond the Super Bowl win. When people still try and characterize him the way I used to think of him, I also have to point out that off the field problems with Seahawk players are way less than any of the previous coaching regimes, Holmgren’s included. On a side note, I happen to be in LA for the week and have been gratified by all the Seahawk gear being worn. There were quite a few 12s in Manhattan Beach last night. And Plaschke is already questioning whether Clay Helton is the man for the job, after admitting he campaigned for the coach in a column last year. Look’s like Bill is 0-2 on the topic of USC football coaches. LOL. Thanks for the review of history. It reinforces my appreciation for this era of Seahawks football. Someday these will be the “good old days”. 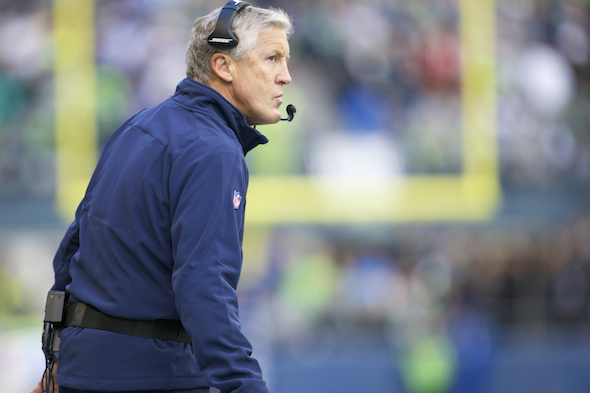 I shared your skeptical nature when Rumors were churning around Seattle that Carroll would be named the next Seahawk coach. What do we want that guy for was a more common thought that many of us then would care to fess up to now. We are fortunate to have such a winner manning the sidelines for our home team. Much like RW? There is just sooooo much more to the man than ties to a pigskin. Both of those guys care about people deeply and use their star power to help make a difference to those who are either less fortunate or need the boost from celebrity status while battling life’s adversity. I agree with the good ole days statement. Pete and Russ will be talked about long after many of us move on from this rock we choose to Call Earth. What outstanding individuals we are fortunate enough to have to represent the people and fans who happen to congregate in Washington State and support pro football. Most communities would be lucky to have such strong role models to shine on our behalf. True winners to be enjoyed and be proud of. We are VERY lucky that Paul Allen had that vision when he shelled out a mind blowing amount of money at the time(and granted more power than most head coaches hold in the decision making process at Pete’s insistence). He took the vision top task and we have never looked back in a negative manner. Thanks Paul. You are amazing in your life’s accomplishments which include saving Pro Ball in Seattle.